When it comes to kitchen backsplashes, you have a lot of choices at your disposal. There’s brick, ceramic, glass and steel… However, did you know that you also have eco-friendly alternatives, as well? In one of our Green Living articles, we told you that “materials with low VOC [like] ceramic tile, recycled content glass or sustainable wood” were good options. Today, we’re here to expand on that idea and provide you with more environmentally friendly options for kitchen backsplashes. You may be wondering how glass can be recycled and made into a backsplash in the first place. Producers start off with wasted glass that has been saved from a landfill and glass that has been properly recycled by consumers just like you. They begin by melting down the glass in a heated furnace with temperatures hitting well over 2000 degrees Fahrenheit. This liquid glass is then put in a mold and trimmed to the right size and form. One of the benefits of using recycled glass tiles is that it is usually left in its original form. Some are mixed with industrial colors, but fully eco-friendly glass tiles are left alone. This means that no two backsplashes will look alike, and you are guaranteed your own unique look in the kitchen! Aluminum tiles are made from 100 percent recycled metal. They are excellent choices for a modern kitchen, especially if you’re opting for an entirely eco-friendly kitchen complete with concrete countertops and recycled wood cabinetry. Prices start around $35 per square foot, and you can even install the backsplash yourself. On top of that, it is easy to clean by simply using a soft rag, liquid dish soap and warm water. Wood-based wall coverings are generally not sustainable. However, some companies offer reclaimed wood and bamboo to create backsplashes. 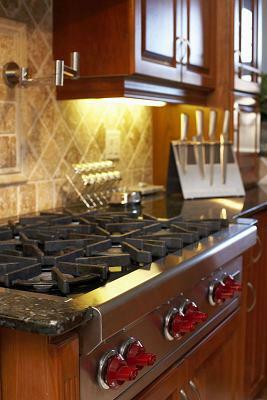 It is often a good idea to match this type of backsplash up with butcher’s block countertops. This recycled wood has been reclaimed from old wooden structures like barns and farmhouses or even from barley/hay/wine barrels. They ways in which recycled ceramic tiles are constructed vary with each manufacturer. Generally, recycled ceramic tile backsplashes are composed of both and pre- and post-consumer waste products: unwanted dirt, dust, glass, plastic and stone. These materials are mixed together and broken down into a fine powder that is then used to create ceramic tile. For more eco-friendly tips, take a look at the Green Living category on the Buy Owner Blog!